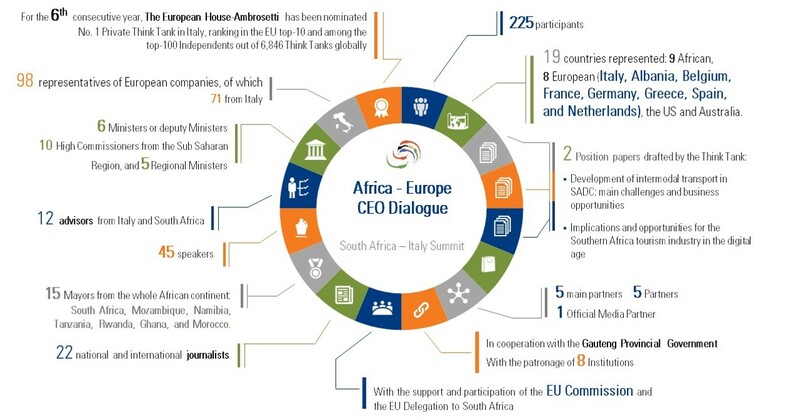 The fifth edition of the South Africa-Italy Summit/INDABA – entitled “Africa Europe CEO Dialogue” – was held on October 23 and 24 in Johannesburg, South Africa. By expanding the community of leaders to the regional level, the 2018 Summit aims at creating an active and growing community encompassing relevant regional organizations, European and Southern African Companies. The Gala Dinner at The Summer Place on October 23rd and the reception cocktail at the Residence of the Italian Ambassador in Pretoria on October 24th in Pretoria provided further opportunities for networking and interaction. Rob Adam (Managing Director, South African Radio Astronomy Observatory; Project Director, Square Kilometre Array); Paolo Borzatta (Senior Partner, The European House – Ambrosetti); Nino Cingolani (Vice President International Projects, Italian State Railways); Marcus Cornaro (EU Ambassador to South Africa); Niccolò D’Amico (President, Italian National Institute for Astrophysics); Deon de Beer (Chair in Innovation and Commercialisation of Additive Manufacturing, Central University of Technology); Valerio De Molli (Managing Partner and CEO, The European House – Ambrosetti); Pietro Giovanni Donnici (Ambassador of Italy to South Africa); Alec Erwin (Chairman, UBU Investment Holdings; former Minister of Public Enterprises and former Minister of Trade and Industry, South Africa); Mike Fanucchi (Chief Customer Of_cer, Transnet); Lorenzo Fioramonti (Deputy Minister of Education, University and Research, Italy); Tim Harris (CEO, Wesgro – Cape Town & Western Cape Tourism, Trade & Investment Official Agency); Bernadette Jagger (Deputy Minister of Environment and Tourism, Namibia); Stella Kilonzo (Executive Director, Africa Investment Forum, African Development Bank); Fabio Lazzerini (Chief Operating Officer, Alitalia); Phuti Mahanyele (Executive Chairperson, SIGMA Capital); David Malemolla Makhura (Premier of Gauteng); Peter Malungani (Chairman, Peu Capital Partners); Buti Manamela (Deputy Minister of Higher Education and Training, South Africa); Stefano Manservisi (Director General for International Cooperation and Development, European Commission); Trevor Manuel (President’s Special Envoy on Investment, South Africa; Chairman, Old Mutual); Herman Mashaba (Mayor of Johannesburg, South Africa); Joel B. Matiza (Minister of Transport and Infrastructural Development, Zimbabwe); Antonio Almeida Matos (Chairperson, Mozambique Maputo Corridor Logistics Initiative – MCLI); Thabo Molekoa (CEO, Thyssenkrupp AG, Sub Saharan Africa); Peya Mushelenga (Minister of Urban and Rural Development, Namibia); Ranieri Niccoli (Chief Manufacturing Of_cer, Automobili Lamborghini); Tseke Nkadimeng (Founder, Moopong Investment Holding); Lapo Pistelli (Executive Vice President of International Affairs, ENI); Jeff Radebe (Minister of Energy, South Africa); Jonathan Reichental (CIO and CTO, City of Palo Alto, California); Shirish Soni (Ambassador of South Africa to Italy); Luiz Zerbini (Director, International Centre for Genetic Engineering and Biotechnology, ICGEB, Cape Town). 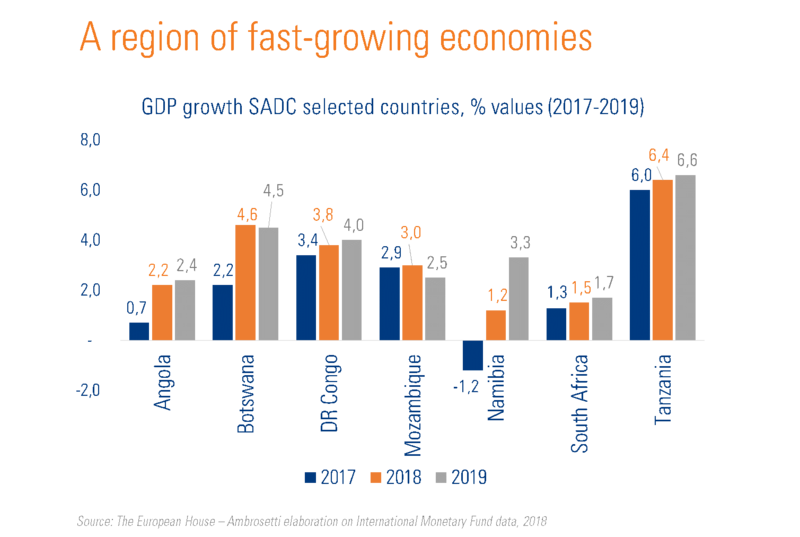 After the sharp slowdown of 2016 due to the fall of commodity prices, in 2017 the GDP growth of Sub-Saharan Africa started recovering at a sound +2.8%. The figure is now projected to reach 3.4% in 2018 and 3.7% in 2019 (IMF, 2018). 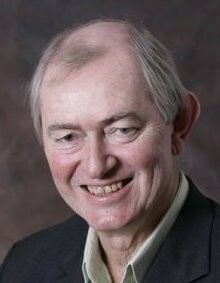 The region’s recovery is primarily driven by main SADC economies, Angola, Tanzania and South Africa, the last of which is benefiting from a new cycle of economic reforms promoted by President Cyril Ramaphosa. While Tanzania has been experiencing an average GDP growth rate of 7% since 2014, Angola and South Africa are expected to strengthen economic growth in 2018 and 2019, reaching an annual GDP growth of 2.4% and 1.7% respectively. Looking at other countries, the best performances in 2017 were registered in Botswana (+2.2%), DR Congo (+3.4%), Mozambique (+2.9%) and Zambia (+3.6%), which economies are all expected to accelerate in the next two years. 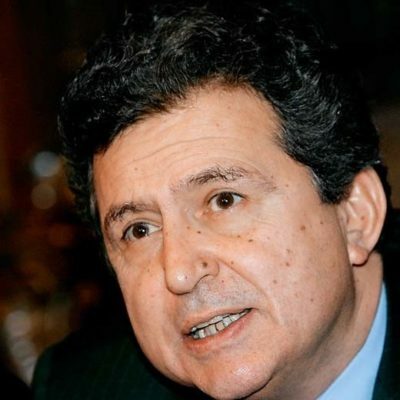 Together with stronger global growth and higher commodity prices, an important stimulus to African recovery will come from improved market conditions and the development of free trade in the region. In this regard, the European Union will play a significant role in boosting trade and investment thanks to the SADC Economic Partnership Agreement (EPA) signed in June 2016 with most SADC members (Botswana, Lesotho, Mozambique, Namibia, South Africa and Swaziland). Thanks to the new SADC EPA framework, the EU guarantees Botswana, Lesotho, Mozambique, Namibia and Swaziland 100% free access to its markets, removing custom duties on 98,7% of imports from South Africa as well. 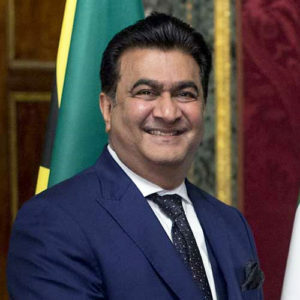 In the long run, the creation of the African Continental Free Trade Area (AfCFTA), based on the pan-African agreement signed in March 2018, will further boost trade in the whole continent. Looking at products and goods traded between the EU and the SADC, statistics show that European countries tend to import large quantities of precious metals (9,932 €mln in 2017) and mineral products (4,557 €mln). 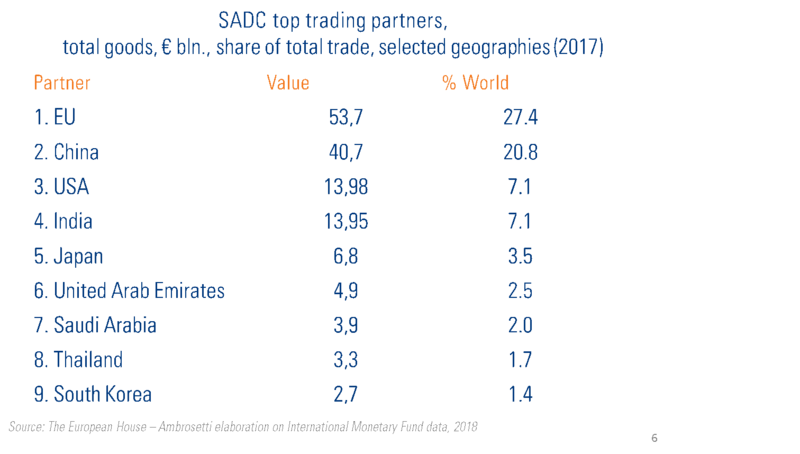 On the other hand, SADC economies rely on European exports as regards machinery and appliances (9,255 €mln) and transport equipment (5,324 €mln). Together with trade, also FDIs in SADC region are expected to increase in the next years. In 2016, the total value of FDIs in Southern African countries was 304 US$ bln, 45% of which only in South Africa (total 136 US$ bln), the natural and most advanced capital market of the region. 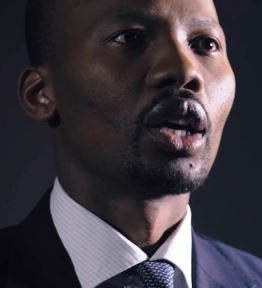 In comparison with 2007, the best pre-crisis performing year, FDIs’ inward flow increased by 47,2%, demonstrating the clear improvement of SADC’s investibility. 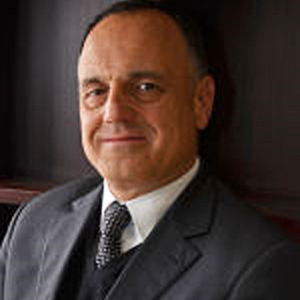 The European House – Ambrosetti is organizing a platform of dialogue and debate between Southern African and European business leaders. The purpose is to foster cross-national business engagement and investment relations, increasing mutual knowledge and proting from concrete business opportunities. A Gala Dinner at the Summer Place on October 23rd and a reception cocktail at the Residence of the Italian Ambassador in Pretoria on October 24th will provide further opportunities for networking and interaction. 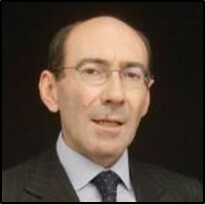 Further information to obtain the preferentiali airfares will be given only to the registered attendees. 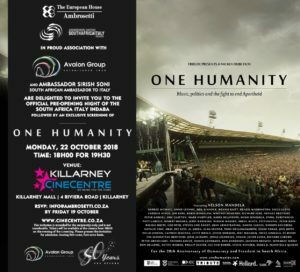 Join us for a pre-opening function of the summit followed by an exclusive screening of ONE HUMANITY – A film that tells the story of how the world came to focus on the ending of the apartheid regime in South Africa through two star-studded concerts that were broadcast around the world. 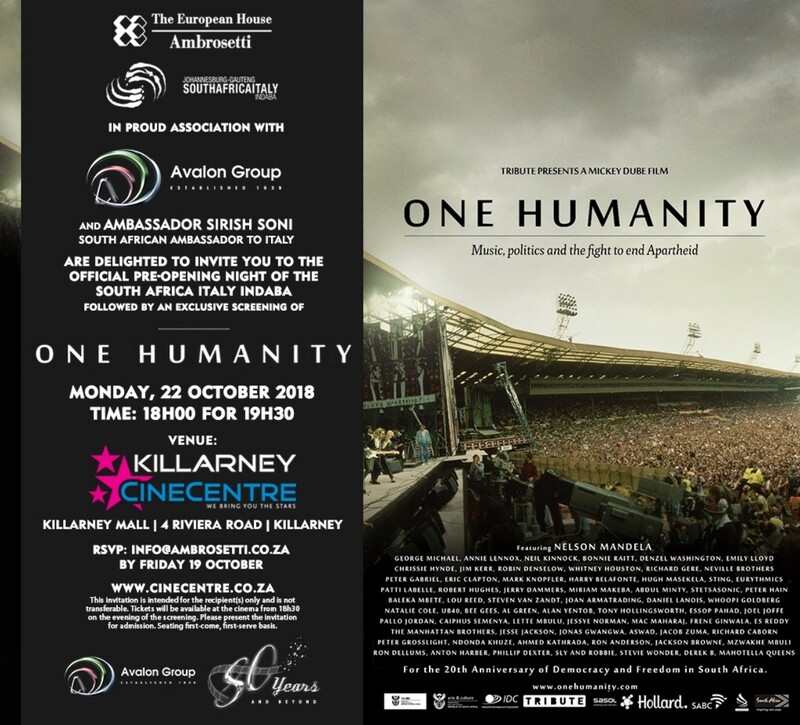 The story is multi-layered and gives voice to the history of the global anti-apartheid movement from those that were intimately involved.